Foreign language teachers in Japanese universities often face great difficulty in breaking through the social barriers inherent in the traditional Japanese classroom. In a culture where a student’s “standing out” can be interpreted as “showing off”, and mistakes more often seen as social failures than learning opportunities, students are naturally cautious about using a foreign language in front of their peers. This paper looks at using Moodle, an open source Course Management System, to foster the growth of communities in order to facilitate the transformation of the classroom into a more stress-free and relaxed environment more conducive to constructive learning. 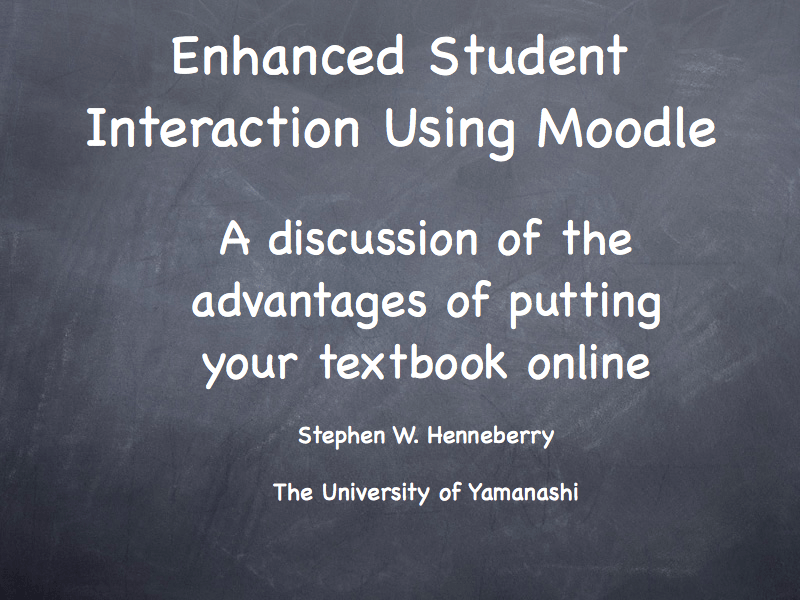 In this project, Moodle was used to support a textbook based conversation class for university freshmen, allowing the teacher to remove quizzes and homework from the physical classroom. This in turn created more time for both Teacher-Student and Student-Student interaction in the once-weekly class meeting. Online forums were also implemented, on a voluntary basis, allowing students to demonstrate ideas and opinions in the target language outside of the classroom. This paper looks back at the advantages and disadvantages of this system from both the Teacher and Student perspectives. This was written by Stephen W. Henneberry. Posted on Saturday, June 3, 2006, at 10:50 am. Filed under Presentations. Tagged Moodle. Bookmark the permalink. Follow comments here with the RSS feed. Both comments and trackbacks are currently closed.